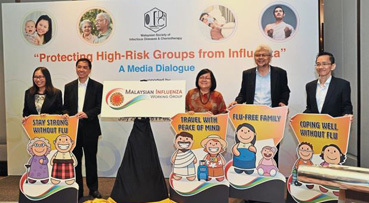 PETALING JAYA: Malaysians should stay on guard against infectious diseases such as influenza as it can spread easily, with high-risk groups being more vulnerable, say health experts. The Malaysian Society of Infectious Diseases and Chemotherapy (MSIDC) said influenza was often confused with the common cold as both shared similar symptoms. MSIDC cautioned that influenza was considered more dangerous as it could lead to hospitalisation and even death for those in the high-risk groups. It added, however, that influenza is a vaccine-preventable disease. “Given that the virus mutates constantly, an annual influenza vaccination is recommended by the World Health Organisation for those at high risk,” it said. To raise awareness of the impact of influenza, MSIDC held a dialogue session on Friday to discuss the prevalence of the disease in the country. Dr Zamberi said Malaysians, even those in the high-risk groups, generally did not take influenza seriously. “Yet influenza can and has caused epidemics and pandemics in the past. “Today, people are travelling more than ever, whether for business, leisure or on pilgrimages. “Hence, it is important to protect oneself by getting vaccinated against the flu at least two weeks before travelling,” he said. Dr Zamberi added that Muslim pilgrims should get the vaccination because respiratory tract infection was the most commonly trans¬mitted disease during haj pilgrimages. According to Dr Musa, young children and pregnant women were vulnerable to the virus as well, adding that complications for those in that group could be life-threatening. He said vaccinations can help prevent or limit cases where the disease could spread from one child to other family members. “For parents who are hesitant about vaccinating their children, my advice is to look at the significant advantages of the vaccine and consider its protective role,” he added. Dr Tan highlighted the higher risk levels faced by the elderly, many of whom already suffered from chronic illnesses. “The immune system weakens with age and influenza is at its deadliest at the extremes of the age spectrum,” she said, adding that annual flu vaccination was recommended. Dr Pang pointed out that patients with pre-existing chronic respiratory conditions were also highly susceptible to further complications upon contracting the flu, as they might develop secondary lower respiratory tract infections such as pneumonia and other acute respiratory diseases. At the event, MSIDC launched the Malaysian Influenza Working Group to address pertinent issues relating to influenza locally and internationally. According to MSIDC, the influenza vaccine is available at private medical centres and private clinics in Malaysia.